Identification. "Türkmenistan," with the Persian suffix "-istan" to indicate "land of the Türkmen," has been home to the Turkic people today known as Türkmen since about the tenth century. Türkmen descend from the Oguz, a confederation of tribes which migrated out of the Gök Türk empire (c. fifth–eighth centuries) near Mongolia. It is thought that the term "Türkmen" was used to classify the Oguz who had adopted Islam, although this is not conclusive; the designation had earlier held political significance. The name "Türkmen" eventually replaced "Oguz." The majority of Türkmen live in the country Türkmenistan, formerly the Türkmen Soviet Socialist Republic (SSR) of the Soviet Union. Significant Türkmen communities live in Iran, Afghanistan, Iraq and Turkey. There are also groups in Azerbaijan called Trukhman. Location and Geography. Türkmenistan lies east of the Caspian Sea, north of Iran and Afghanistan. It shares a short northwestern border with Kazakhstan and its eastern border with Uzbekistan. Ninety percent of Türkmenistan consists of the Gara Gum and Gyzyl Gum deserts, which are largely uninhabited. The Garagum canal irrigates much of the country. Summers are hot and dry; winters bring freezing temperatures, but snowfall is infrequent. Türkmen have adapted their lifestyle to the desert environment. They drink hot green tea to keep the body cool during summer and have used the desert to their advantage in times of strife. In the 1920s, when the Basmachis (members of the Turkistan National Liberation Movement) had to escape from Russian troops, they fled into the desert. Demography. Almost 4.7 million people live in Türkmenistan: 77 percent of them are Türkmen, 7 percent Russian, 9 percent Uzbek, with small numbers of Kazakhs, Armenians, Azerbaijani Turks, and other ethnic groups. Türkmen are a fast-growing group, averaging five children per family. Total population growth is at 2.5 percent. Linguistic Affiliation. Türkmen is a member of the Oguz branch of Turkic. It is closest to the language spoken in Turkey and Azerbaijan, but mutual intelligibility with all Turkic dialects is high. There are many borrowed words from Arabic, Persian, and Russian, especially for technical and scientific terms. Türkmen writers shared a common Turkic literary language (Chagatai) with other Turks until the eighteenth century when a discernible Türkmen literary language began to emerge. The modern standardized language was developed in the 1920s from the Teke and Yomut dialects as a result of Soviet interest in creating a national literary language. The tribal dialects, which were always mutually comprehensible, now share a standardized written language and grammar. The Türkmen and other Turks, who had used an Arabic-based script for centuries, replaced it with an "international" Latin-based script in 1929. In 1940, when Soviet policy shifted again, the Türkmen were assigned a Cyrillic alphabet. The Türkmen chose to adopt a Latin-based script similar to the one they had used earlier. horses. A Soviet law outlawing private ownership of livestock in the 1920s, and attempts to erase the Akhal-Teke through breeding with Russian horses, put it at great risk. In 1935 a group of Türkmen rode three hundred miles to Moscow to demonstrate their desire to protect the breed. By 1973, as a result of the slaughter of horses for meat and attempts at crossbreeding, only eighteen pure bred Akhal-Teke were left in the Soviet Union. In 1988 the trek to Moscow was reenacted to demonstrate that Türkmen still considered the horse a defining symbol of their culture. Examples of the animal's importance are found in the efforts to build an independent Türkmen national culture since 1991. Independence from the Soviet Union restored the right of Türkmen to own horses and encouraged promotion of the Akhal-Teke breed. President Niÿazov gives horses as gifts to heads of state and he institutionalized the animal's symbolic value by having a picture of an Ahal-Teke printed on the new money (the manat ). In 1995 he established 27 April as the Holiday of the Türkmen Horse, celebrated with horse races at the hippodrome in Aşgabat. The state seal, which was created in 1992, also bears the image of the Akhal-Teke. A white horse stands against a background of sky blue (an important color in Turkic culture), encircled by five tribal carpet patterns ( göl ). An outer ring displays cotton and wheat. At the top center of the outer ring is a crescent moon alongside five stars, representing the five tribes and the nation's Islamic heritage. This seal is stamped on official documents, and no paperwork is official without it. The Türkmen flag also features the five tribal göls and the Islamic crescent moon. As an emblematic color of Islam, the green background emphasizes the nation's Muslim heritage. Emergence of the Nation. Türkmen identity and culture have been tied closely to the political history and shifts in power in Central Asia. Although Türkmen had their own religious, cultural, and political traditions, the emergence of powerful neighboring states affected their governing systems, economy, and ecology and sometimes altered their way of life. The Russian invasion subjugated the Türkmen, ended practices such as slavery, and brought the Transcaspian Railroad as well as Russian colonists. The conquest of the Türkmen occurred at the battle of Gök Tepe in 1881, but the Russian army continued fighting until it had secured Merv (Mary) in 1884. Thousands of women and children were slaughtered at Gök Tepe. That memory is marked by the 12 January day of commemoration and by the extravagant mosque that was erected near the site of the massacre. These experiences have fostered a sense of Türkmenness that in some respects is stronger than the sense of Turkicness. National Identity. The establishment of the Soviet Union after 1917, and the creation of the Türkmen SSR ushered in a new era of Türkmen culture and identity. Forced collectivization stripped Türkmen of their lands, nomadism ceased, and cotton became the main agricultural product. Intellectual, military, and religious leaders were purged, and political and religious structures were attacked. The government tried to supplant tribal identity with a Soviet one. The Türkmen rebelled in guerilla-like resistance groups ( Basmachi ) into the early 1930s. While the Türkmen were united for the first time and a stronger sense of Türkmenness was fostered, tribal affiliation was not eradicated. Türkmenistan attained its independence on 27 October 1991 with the break-up of the Soviet Union. Saparmurat Niÿazov, who had been chairman of the Supreme Soviet since 1985, became president in 1990 and then "President for life" in December 1999. His popular name, Türkmenbaşy, means "head of the Türkmen." Today the Türkmen are evolving once again as they learn to run a modern, sovereign country for the first time and take back their identity by redefining their national culture. The country is working to forge a place for itself in the global community, establishing relations with neighbors like Iran and potential investors in the West, and joining the United Nations Organization in 1992. Ethnic Relations. Türkmen are culturally and linguistically related to other Turkic peoples, such as Uighurs, Kazakhs, Uzbeks, Kirghiz, Tatars, Başkurts, Azerbaijanis, and those in Turkey. They are descended from larger Turkic groups living on the Chinese border that began to migrate westward in the ninth century. While their migrations often were due primarily to a lack of pasturage, military and political conquests shaped the way of life in the new lands. For many centuries the Türkmen were a fragmented group of tribes that associated and warred according to their immediate needs. They formed the ethnic base of great empires, however, such as the Seljuks and Ottomans, and of modern states such as Azerbaijan and Turkey. Their reputation as magnificent horsemen and warriors earned them a place as frontier fighters when those empires attempted to expand their borders. They also raided settled neighbors, especially Persia, for slaves and wealth. Modernization, Sovietization, and the introduction of western culture have altered some traditional ways, and others have lost prominence because of the proliferation of urban centers. Furniture was borrowed from the West, and its use varies. Some homes have furniture, and some do not. The traditional bedding consists of padded mats that are laid on the floor at bedtime. In the morning they are folded and placed in a designated corner with the blankets and pillows. This allows sleeping space to be used for other purposes during the day. Some families, primarily in the cities, have a work table in the kitchen area, but most Türkmen eat sitting on the floor. They spread a large cloth on the floor, with food and dishes placed on top of it. Guests occupy the place of honor, which is made soft with pillows or quilts. Türkmen traditionally have a toilet outside of the main living space. Although some rural families use outhouses, a separate building containing a toilet and sink is typical. In the cities, where most people live in apartments or small houses, there is no space for this arrangement, but many households separate the toilet by locating it in one room and placing the sink and shower in a nearby room. Ashkhabad, Türkmenistan, features many one-story homes. Most homes have a walled courtyard. socialize at the same time. Cooking done outside (roasting meat and popping corn) is handled by men and often becomes a social activity, with neighbors and friends forming a small crowd. The separation of space with regard to gender is an aspect of life that varies greatly. Men and women may sit and eat together, or may remain in separate rooms during a social event. Some women continue the tradition of wearing a yaşmak (head scarf) in the first year of marriage. The bride holds the corner of her scarf between her teeth to serve as a symbolic barrier between her and any male visitors who are not family or to show deference to her parents-inlaw; the scarf also prevents her from speaking. A woman may stop wearing a yaşmak after one year of marriage, after the birth of a child, or as a result of an agreement within the family. Türkmen are conscientious about keeping living spaces clean. They never wear shoes in the house but wear and provide guests with slippers. Acts of personal hygiene such as cutting the hair or cutting or filing the nails are done in the bath area, never in the main living space. Almost every available space in a home, except the washroom and kitchen, is covered with carpets. Floors are covered with multiple carpets, chairs are draped with a medium-sized rug or a square seat covering, and the walls display large and often valuable carpets. The architecture of homes does not vary greatly throughout the nation. People live in one-story homes or stark Stalin-era apartment high-rises. Most common are modest houses with walled courtyards that allow families to spend time outdoors, where it is cooler, and private. There are variations in the amenities and the amount of space, both of which are more limited in urban areas. The traditional structure is a felt tent called a "black house" ( gara oÿ ). A thick felt covering is draped over a wooden frame, leaving an entrance and a round opening at the top to allow smoke to escape. The frame is collapsible so that the tent can be dismantled quickly for travel. Today most Türkmen live in modern housing, and gara oÿs are used only for summer recreation and holidays. Food in Daily Life. The diet shows a Russian influence and imported items are available at a high price, but Türkmen food generally remains traditional. 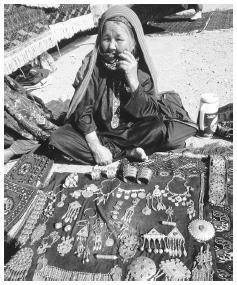 A woman sells jewelry at the Ashkhabad Sunday bazaar market. Silver jewelry is common. will not fill the guest's cup to the brim to demonstrate that she is being attentive, and will pour many times if she wishes the guest to stay. Türkmen eat a lot of meat, primarily from sheep and cows but also from camels, goats, chicken, and despite the Muslim tradition, pigs. They also use milk from these animals. Meat is boiled or fried inside a casing of dough. Manty is a popular version, eaten with yogurt on top. Soup usually is served with meat and/or noodles and may be eaten for breakfast. Bread is eaten at every meal. Russian-style loaves can be bought cheaply, and traditional flatbread (çörek) is often made at home in a tamdyr. A tamdyr is a traditional Central Asian dome-shaped clay oven placed outside the home; in the cities, several apartment buildings may share a single tamdyr. Türkmen also drink black tea, seltzer water, and imported sodas. Despite the ban on alcohol among some Muslim peoples, Türkmen drink wine, beer, and liquor; Türkmen wine has won international competitions. Food is rarely bought prepared or processed, and there are few restaurants. Fresh and dried fruits, vegetables, nuts, and grains are bought at the bazaar, while butter, bottled water, milk, and sausages are usually purchased from state stores. Basic Economy. There were drastic economic fluctuations when price controls were lifted by the Soviet government in the late 1980s and when the new government attempted to stabilize the economy and introduce a new currency. 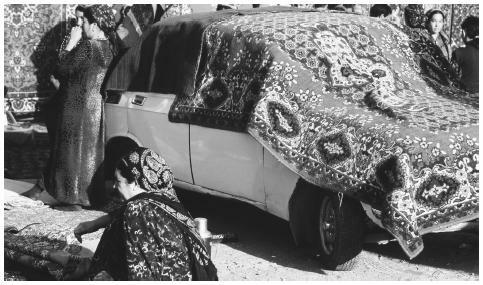 Salaries are very low, with workers in the state sector averaging approximately $40 per month; many people supplement their income by using private cars as taxis or selling goods at bazaars. Many households are multigenerational so several salaries, stipends, and pensions are combined to support the family, although some young professionals who work for Western companies live on their own. The government provides electricity, gas, water, and bread at a nominal charge. This helps poor families, but has produced a population that is accustomed to wasting basic resources. In some neighborhoods, access to water is highly restricted and the electricity supply is unstable. Land Tenure and Property. Historically, land and water were held in common by villages and nomadic groups. Under the Soviet system all land and property was under government control. The new government has been moving slowly toward privatization and redistribution of collective farmland. In 1995 the government restructured farms into peasant associations so that individuals, but preferably groups, could lease land. The administration also revived the traditional position of mirap (the post responsible for overseeing water distribution and teaching irrigation management). Legalities for foreign ownership of land and buildings are in the process of being settled. Commercial Activities. Agriculture is the basis of the economy, especially cotton farming. Many Soviet-era state and collective farms still operate, producing grains, melons, grapes, and silk as well as cotton. Livestock raising is a time-honored occupation, and the milk, skins, and wool from cattle, sheep, camels, and goats generate other enterprises. While many manufactured goods are imported or bought on trips abroad to places like the United Arab Emirates or Turkey, textiles are still produced for daily use. Türkmen carpets are known worldwide for their beauty and quality. Many individuals make carpets at home, but the Türkmenistan Carpet Productional Association oversees carpet factories, operates the only carpet store, and controls exports by requiring its seal of approval on carpets leaving the country. It is illegal to export national treasures such as antique carpets. Major Industries. The oil and gas industries occupy an important space in Türkmenistan's current economic development as well as in its vision for the future. Attracting foreign investors and constructing pipelines have been at the top of the government's agenda since 1992 when they began holding international conferences to gather oil companies and promote international competition for investment. To encourage such capital investments, efforts have been made to improve the banking industry and tax codes. Türkmenistan's commitment to these industries also impacts its foreign policy as it nurtures relationships with many potential investors and customers as well as neighbors like Iran which may be in a position to host a gas or oil pipeline. The Petro-chemical industry has been developing slowly but consistently. Two refineries, one in Türkmenbaşy and one in Çärjew (Türkmenabad), have an annual capacity to process 7.7 million tons of oil. A facility to produce poly-ethane was opened in 1997. Chemical facilities have been established to produce artificial fertilizers, sulphuric acid, and ammonia detergents. 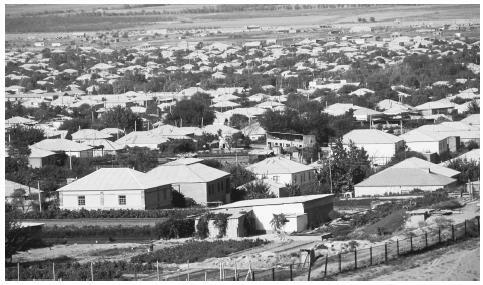 A super-phosphate factory, a sulphur factory, and iodine and bromine factories have been erected in different regions including Çärjew, Gurdak, and Çeleken. Trade. Imports include processed food and nonfood products for the consumer market, industrial chemicals such as fertilizers, farm machinery, and metalwork for the agricultural industry. Exports include cotton, natural gas, and oil products. Türkmenistan has vast reserves of oil and natural gas, and arrangements to export gas and oil through pipelines are primary concerns of the government and foreign investors. Division of Labor. The minimum age for employment is sixteen, but during the cotton harvest many schools close and children spend their day in the field. Symbols of Social Stratification. Traditionally, distinction among the Türkmen did not fall along class lines. Perhaps the greatest differentiation lay in the lifestyles of nomadic pastoralists ( çarwa ) and settled agriculturalists ( çomur ). While Türkmen generally preferred the freedom of roaming with their herds, neither category was necessarily permanent. Tribal affiliation was always the supreme marker among Türkmen. During the Soviet period an elite developed among the party hierarchy and some intelligentsia (writers, artists, scholars), but one could fall from grace easily. As politics shifted over the decades an author's writings from one era could later be used against him or her and lead to persecution. For example, intellectuals who had fostered the Soviet policy of korenizatsiia (a program to promote national languages and fill official positions with natives) in the 1920s were labeled enemies of the state when policies changed in the 1930s. Those who stayed in favor of the Party were allowed privileges like summer homes ( dachas ) in rural areas like Firuze. There are emerging economic classes in Türkmenistan today, as new jobs are created and Türkmenistan's new global position redefines job skills. Dramatic changes in agriculture, the oil industry and the business world have created spaces for the post-Soviet Türkmen, especially younger people who know foreign languages, primarily English. Still tribal loyalties and personal contacts remain important for obtaining positions and favors. Styles of dress do not signify social stratification. Women wear traditional clothing such as long, flowing solid-colored dresses in bright tones decorated with elaborate embroidery ( keşde ) around the collar. They sometimes cover their heads with colorful scarves for protection against the elements or sand, but there are no social rules that require head coverings. Most women prefer the traditional styles of long upswept hair for adults and long braids for girls. Jewelry, especially made from silver, and pierced ears are very common. Men wear Western-style pants and jackets, but some wear traditional clothing. The high lamb's wool hat ( telpek ) is worn even during the hot summer months. For ceremonies and special occasions white telpeks are worn with dark, baggy pants tucked into high black boots. Older men wear sheepskin coats with the fur on the inside or red and yellow striped robes that fall to the knees. Women in a Türkmenistan have historically been viewed as equal partners. vote to five-year terms. Executive power is exercised by a President who is also chairman of the cabinet of ministers. Ministers oversee sectors of the government and economy such as domestic affairs, foreign affairs, the oil industry, and agriculture. Leadership and Political Officials. Despite the unopposed establishment of Saparmurat Niÿazov as president for life, small unofficial opposition movements exist underground and in foreign countries. The president's portrait appears on most public buildings and is printed on the currency. Social Problems and Control. The government does not restrict freedom of travel, but the southern border zones and some areas of high security require a permit for visitation and are off limits to foreigners. Citizens carry internal passports primarily as a form of identification. Military Activity. There is national conscription to staff a small military force that is plagued by corruption and disorganization. Neutrality is the policy of the post–Soviet nation. There is an unofficial group in Aşgabat that supports battered women, and efforts are made to care for orphans and the mentally and physically disabled. People pay 1 percent of their wages to receive a pension after retirement. Small pensions are also paid to invalids and war veterans. Several organizations have been founded by foreigners to help establish democracy. Several are concerned with human rights, and others are concerned with the environment. 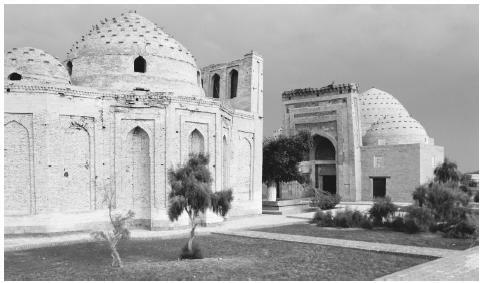 Ancient Islamic buildings in Türkmenistan. Few mosques were open during the Soviet period. as are the livestock industries and transportation. The Relative Status of Women and Men. Historically women were considered equitable partners. The last independent Türkmen leader was a woman, Güljamal Hatun, who succeeded her husband Nurberdi Han. Under the Soviet system women began to work outside the home and it became more common for women to attain higher education. Women have retained the right to education and work. In fact, many of the students who have taken part in programs in Turkey and the West have been female. There are unacknowledged inequalities which are difficult to document. The traditional role of homemaker and caregiver prevents some women from seeking roles outside of the home. There are anecdotal reports of domestic violence, but it is not spoken of publicly. Marriage. Türkmen usually marry in their early twenties, although some delay marriage to begin a career. The traditional expectation is to have a baby within the first year of marriage, and the groom's parents can demand a divorce if they suspect that the bride is infertile. ATürkmen wedding is a festive occasion characterized by historic Turkic rituals. There is an exchange of value called galyñ (bride price), which despite its name, does not mean that a bride is purchased; it is a historic, complex approach to redistribution of wealth in the traditional communities and is an honored tradition even today. The Soviet government established a civil system and discouraged Islamic rites, but they persisted. There is a new and surprising trend among Türkmen women in urban centers who feel compelled to have children but do not have a husband; they cannot find a man that they think would make a good husband and prefer to be without one. Polygamy was never common among the Türkmen. Inheritance. The Soviet government, and the Türkmen government after that, established civil laws of inheritance; however, Türkmen prefer to follow Adat (custom) when possible, even over Sarigat (Islamic law). Traditionally the youngest son would remain with his parents inheriting the home upon their deaths; daughters would marry and move into their husband's home. Kin Groups. In more than ten major tribes, there is complex kinship systems with distinct terms to refer to gender, seniority, and to indicate whether a person is related on the mother's or father's side. Families are close, and a holiday or a birthday celebration often fills a large home. The Türkmen were organized by their kinship system into families, clans, and tribes. These relations governed loyalties, economics, marriages and even migration. Historically these groups interacted and sometimes merged into confederations to suit political needs. The Soviet system and the present government have downplayed tribalism to promote nationalism. Most people continue to marry within the tribe. Although it is officially discouraged, there is some hiring along tribal lines. Infant Care. Mothers and other female family members play an important role in a child's life. Male babies are circumcised in a special ceremony led by a molla, usually attended only by close family members. Certain superstitions surround infants: a newborn should not be seen by non-family members for the first forty days, and a Koran should be placed near the cradle to help protect the baby and so that it will never be "alone." Child Rearing and Education. Child rearing is primarily the responsibility of women, but elders and older siblings have authority over children. Fathers tend to take more responsibility for raising boys and teaching them about labor, ethics, and etiquette. Mothers oversee girls' education in homemaking. A young girl spends a great deal of time preparing the items necessary for marriage and practices cooking, sewing, embroidery, and textile making. The Soviet system of free education remains basically intact. There are kindergartens and elementary schools, and an eighth grade education is mandatory. Seventy-seven percent of schools teach in Türkmen, and 16 percent in Russian. Türkmen is gaining educational prominence, and the role of English has expanded. Adults study Türkmen in free workplace classes, and many take private lessons to learn English. Higher Education. The Soviet system of state education remains fairly intact and has been free and open to all qualified individuals. However, a July 2000 declaration of reform reports that the numbers at universities will be reduced so that instructors have only five students in a class and admittance will be based on an individual's genealogy. There are several higher institutes in Aşgabat, and there is one teacher training college in Türkmenabad (formerly Çärjew). Most courses of study are five years, although graduate and doctoral work can take many more years. There are kindergartens and elementary schools ( mekdep ) and graduation of eighth grade is mandatory. Under the Soviet system, elementary schools were organized by language of instruction, either Türkmen or Russian. Russian schools were perceived as better overall, but especially because they taught the language of professionals. However, attachment to the mother tongue was always strong, today 77 percent of schools teach in Türkmen and 16 percent in Russian; there are also some Turkish language schools and a university which charge high tuition. With the country's reorientation, a shift in language prominence has become a national priority. Türkmen is gaining prominence and the role of English has expanded. Even adults try to study in private lessons or with Peace Corps volunteers. All institutions suffer from lack of financial security, dilapidated buildings, lack of textbooks and undertrained teachers. Some foreign experts are lending aid and advice, although progress, especially in the rural areas, is slow. Turkey is printing new nationally-oriented textbooks in the new alphabet for free (although some schools still waiting use the thirty-year-old Soviet textbooks venerating Lenin). Since independence, Türkmen students have had the opportunity to study abroad. Some go to England or the United States, but Turkey has provided the greatest opportunity, training dentists, doctors and other professionals. Teachers have been hit especially hard by the dramatic economic shift since independence. Many are forced to supplement their incomes with private tutorials and still make very low salaries. Despite political and social change, and poor pay, teachers ( mugallyma ) are still held in very high esteem. The rug section of a Sunday market in Ashkhabad. Many carpets are made in private homes. handle responsibilities related to inheritance, property ownership, marriage, family life, deference to elders, hospitality toward guests, and tribal and clan identity. Children are surrounded by multigenerations and learn at an early age to respect elders, even among siblings the eldest is given status. Religious Beliefs. The Türkmen state is secular. While independence inaugurated a mild surge of interest in religion, it seems mostly related to the fact that Türkmen feel their Islamic heritage to be a fundamental aspect of their identity, rather than to a widespread affinity for piety. Other religious groups are represented in Türkmenistan, but Türkmen are Sunni Muslims of the Hanafi school. When Arab and Persian invasions brought Islam to Central Asia (seventh–eighth centuries) the Turkic groups did not all convert at the same time, nor to the same degree. Conversion to Islam depended on time and place, for example, urban centers were more likely to participate in formal rituals whereas nomadic Turks (like Türkmen) mixed aspects of Islam with elements from other practices (like the celebration of Nowruz which came from Zoroastranism) and still retained much of their pre-Islamic heritage (retaining the name of the sky god Gök for the words blue and green). Türkmen began to convert around the tenth century. While their practices still reflect this early syncretism, even non-practicing Türkmen call themselves Muslim and see this as integral to their identity. Religious Practitioners. Religious leaders are called mollas, or işan in the mystical Sufi orders, and käzys interpret Islamic law but do not act as clergy. The oldest man leads the group in prayer. In 1992 the government sanctioned the establishment of the Kazyÿat as the highest religious authority. In divorcing itself from the Central Asian Müftiÿat, the Türkmen leadership declared its interest in promoting Islam as an aspect of national culture. The Committee (Geñes) for Religious Affairs' attachment to the Office of President affords the state oversight of religious affairs in the new state. Rituals and Holy Places. Islamic holidays are celebrated according to the lunar calendar and fall on a different day each year of the Gregorian calendar. Ramadan is the month of fasting; Oraz Bayramy celebrates the conclusion of fasting; and Gurban Bayramy falls 40 days after Oraz Bayramy with the slaughter of a sheep. Few mosques were open during the Soviet period, and most Türkmen prayed at home. Several mosques have been opened since independence, but visits to shrines are more popular. At the tomb of a saint, Türkmen pray for the birth of a child, cure from illness, or good fortune. Death and the Afterlife. Türkmen perform burial ceremonies according to Islamic law and did so even under communism. Women do not attend funerals, but do participate in the commemoratory feasts held at seven days, forty days, and one year after a death. Türkmen prefer to use the term "to pass on" ( aradan çykmak ), rather than "to die" ( ölmek ). The Soviet socialized health care system remains intact and is free to citizens but is insufficient to serve the country's needs. Doctors are undertrained; facilities are in poor condition and are often unsanitary; and medicine and equipment are scarce. Foreign aid has included Turkish ambulances and advice from Western medical personnel. Traditional healers provide treatment using herbs, prayer, and the manipulation of energies. Among the major holidays are Flag Day (19 February), Women's Day (8 March), the first day of spring (21 March), Victory Day (9 May), Constitution Day (18 May), Remembrance Day (6 October), Independence Day (27 October), and the Day of Neutrality (12 December). The battle at Gök Tepe is commemorated on 12 January; 6 April is celebrated as a Drop of Water Is a Grain Gold Day; and the Day of the First Election of the President is marked on 21 June. Other celebrations are held on 27 April (Day of the Türkmen Horse), 25 May (Carpet Day), 17 November (Student Youth Holiday), and 7 December (Good Neighborliness Day). Support for the Arts. Some artists sell their work independently; one can purchase paintings and jewelry from galleries in the urban centers and at bazaars. However, the arts are supported and supervised by the state. Most efforts are aimed at promoting the newly independent Türkmen national identity imbued with a combination of Islamic heritage and traditional Türkmen culture. There has been some foreign support for building museums and some architecture. Literature. Türkmen literary tradition is a rich mosaic of pre-Islamic Turkic elements fused with Islamic influences. Examples of folk traditions still highly valued today include the dastans Gorgut Ata and Göroglu which illustrate early Turkic culture overlaid with Islamic values. A dastan is a combination epic tale and lyric poem which formed the basis of oral tradition. The dastan was sung by a bagşy who memorized thousands of lines and sang them while playing various instruments. In addition to being a pastime which all members of the society could enjoy, the dastan was an oral record of Türkmen history, values, culture, and language. Dastans have played such an important role in Türkmen identity (as for all Turks) that enormous efforts are currently being made to revitalize them (after decades of Soviet suppression) in order to bolster the sense of Türkmen identity and unity. Highly regarded literary figures include the poets Mammetveli Kemine (1770–1840) and Mollanepes (1810–1862), but it is eighteenth century poet Magtymguly who is considered the Türkmen national poet. His poems urged the politically fragmented Türkmen tribes to unite. Both the Soviets and the current government have promoted his wisdom in efforts to foster nationalism over tribalism. Performance Arts. The Soviet system introduced theaters, television, radio, and cinemas to Türkmenistan, which imparted Soviet values. Today satellite dishes are becoming popular in the cities and broadcasts of Indian music videos. Mexican and American soap operas are popular, as well as American pop music. Traditional dancing is strongly promoted by the state and the troupes of female dancers grace the covers of magazines and travel to many neighboring states where they act as cultural ambassadors. In urban centers, Türkmen singers give concerts which combine a fusion of pop and traditional Türkmen music called estrada. The Soviet system of scholarship neglected traditional Türkmen history and culture. Dastans, literature, dance, architecture, language, and the development of the alphabet reflect the nation's intent to authenticate an independent Türkmen identity. Akbarzadeh, Shahram. "National Identity and Political Legitimacy in Türkmenistan," Nationalities Papers, 27 (2): 271–290, 1996. Bartold, W. "A History of the Türkmen People," Four Studies of the History of Central Asia, vol. 3, 1962. ——. Turkestan Down to the Mongol Invasion, 1977. Baskakov, N. A. Turkic Languages of Central Asia, translated by Stephen Wurm, 1960. ——. Voprosy sovershenstvovaniia alfavitov tiurskikh iazykov SSR, 1972. Becker, Seymour. 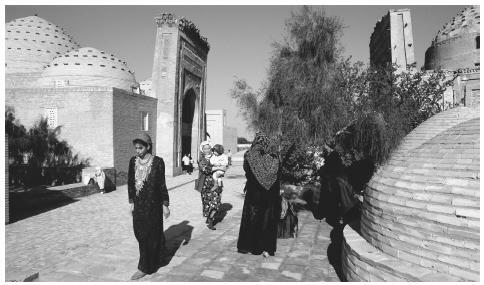 Russia's Protectorates in Central Asia: Bukhara and Khiva, 1865–1924, 1968. Bennigsen, Alexandre, and S. Enders Wimbush. Muslim National Communism in the Soviet Union: A Revolutionary Struggle for the Colonial World, 1979. Caroe, Olaf. Soviet Empire, 1967. Clark, Larry, Mike Thurman, and David Tyson. 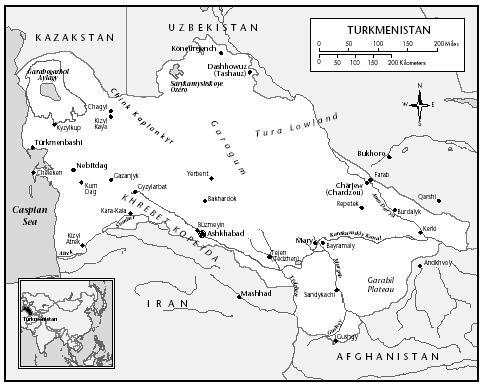 "Türkmenistan," in Glenn E. Curtis, ed., Kazakhstan, Kyrgyzstan, Tajikstan, Türkmenistan and Uzbekistan: Country Studies, 1997. Clement, Victoria. "The Politics of Script Reform in Soviet Türkmenistan: Alphabet and National Identity Formation." MA thesis, Ohio State University, 1999. Dankoff, Robert. Diwan Lugat-it Turk (Compendium of Turkish Dialects), translated by Robert Kelly, 1982–1985. ——. The Wisdom of Royal Glory, 1983. D'Encausse, Helene Carrere. Islam and the Russian Empire: Reform and Revolution in Central Asia, translated by Quintin Hoare, 1988. ——. Decline of an Empire: The Soviet Socialist Republics in Revolt, 1979. DeWeese, Devin. Islamization and Native Religion in the Golden Horde: Baba, Tukles and Conversion to Islam in Historical and Epic Tradition, 1994. Edgar, Adrienne. "Nationality Policy and National Identity: The Türkmen Soviet Socialist Republic, 1924–1929." Journal of Central Asian Studies, 1 (2): 2–20, 1997. ——. "The Creation of Soviet Türkmenistan, 1924–1938." Ph.D. dissertation, University of California, Berkeley, 1999. Ercilasun, Ahmet B. Örneklerle BügünküTürk Alfebeleri, 1996. Evans, John. Mission of N. P. Ignat'ev to Khiva and Bukhara, 1858, 1984. Glantz, Michael H., ed. Creeping Environmental Problems and Sustainable Development in the Aral Sea Basin, 1999. Gleason, Abbott, Peter Kenez, and Richard Stites. Bolshevik Power, 1985. Golden, Peter. An Introduction to the History of the Turkic Peoples, 1992. ——. "The Migrations of the Oguz." Archivum Ottomanicum, 4: 45–84, 1972. Henze, Paul. "Alphabet Changes in Soviet Central Asia and Communist China." Royal Central Asian Journal XLIV: 124–136, 1957. Hostler, Charles Warren. Turkism and the Soviets: The Turks of the World and Their Political Objectives, 1957. Hunsicker, David R., Jr. "The Historical Significance of the Akhal-Teke in Türkmen Identity." Presented at the 11th Annual Nicholas Poppe Symposium, University of Washington, 1999. Irons, Williams. The Yomut Türkmen: A Study of Social Organization among a Central Asian Turkic Speaking Population, 1975. Karryew, A. Istoriia Sovetskogo Türkmenistana, 1917– 1937, 1970. Khalk Malslakhaty: Materialy istoricheskogo zasedaniia Khalk maslakhaty Türkmenistana ot 14 dekabria 1992 goda, 1993. Kirkwood, Michael. ed. Language Planning in the Soviet Union, 1989. Leiser, Gary, ed. and trans. A History of the Seljuks: Imbrahim Kafesoglu's Interpretation and the Resulting Controversy, 1988. Lewis, Geoffrey, trans. The Book of Dede Korkut, 1974. Materialy po istorii Türkmen i Türkmenii, 1939. Öräev, Arazbaÿ. Türkmenistanyñdövlet nysanlary, 1993. Park, Alexander. Bolshevism in Turkestan, 1917–1927, 1957. Paksoy, H. B. ALPAMYSH: Central Asian Identity Under Russian Rule, 1989. ——. "Basmachi ( Basmatchestvo ) Movement and Z. V. Togan: The Turkistan National Liberation Movement." Cahiers d'Etudes sur la Méditerranée orientale et le monde turco-iranien, 27: 301–312, 1999. ——. "The Basmachi Movement from Within: An Account of Zeki Velidi Togan." Nationalities Papers 23 (2): 373–399, 1995. ——. "Introduction to DEDE KORKUT, " Soviet Anthropology and Archeology 29 (1): 14–18, 1990. ——. "Central Asia's New Dastans." Central Asian Survey 6 (1): 75–92, 1987. Pipes, Richard. Formation of the Soviet Union: Communism and Nationalism, 1917–1923, 1964. ——. "Muslims of Central Asia." Middle East Journal IX: (2, 3), 1955. Poppe, Nicholas. Introduction to Altaic Linguistics, 1965. Saray, Mehmet. The Türkmens in the Age of Imperialism: A Study of the Türkmen People and Their Incorporation into the Russian Empire, 1989. Simon, Gerhard. Nationalism and Policy toward the Nationalities in the Soviet Union, translated by Karen Forster and Oswald Forster, 1991. Simsir, Bilal. Türk Yazi Devrimi, 1992. Sümer, F. Oguzlar (Türkmenler), 3rd ed., 1980. Tekin, Talat. A Grammar of Orkhon Turkic, 1968. Togan, Z. V. Türkili Türkistan, 1981. Tyson, David. "Shrine Pilgrimage in Türkmenistan as a Means to Understand Islam among the Türkmen." Central Asian Monitor 1: 15–32, 1997. Vambery, Arminius. Travels in Central Asia, 1970. Vanishing Jewels: Central Asian Tribal Weavings, 1990. Wheeler, Geoffrey. The Modern History of Soviet Central Asia, 1964. Wixman, Ronald. "Applied Soviet Nationality Policy: A Suggested Rationale." Turco-Tatar Past, Soviet Present: Studies Presented to Alexandre Bennigsen, 1986. I am a sociologist, teaching at the University of Hyderabad in India. My recent research interest is in Comparative Islam. I have been trying to look at sociological material on central asia. This article was one of the most useful for me. I am looking for information on marriage patterns, religious rituals / practices, nature of hierarchy in social structure, and generally in cultural practices. My basic interest is in how Islam is implanted in very different types of culture and society and how one sees a great variety that is generated in the process. This article was a good introduction for me Türkmenistan.